For me, school is a refuge. I cannot imagine that sanctity violated by the introduction of weapons. My iPad pinged. I heard a voice from the back of my classroom call out dully, “There was just another school shooting.” But as I looked around, my classmates continued to play word games on the devices in front of them. None of us gasped, or cried, or stopped to acknowledge the tragedy of what we had just learned. None of us reacted like human beings. We certainly didn’t act like children. Our immediate indifference is not for lack of caring: High-school seniors of the class of 2018, like myself, have simply grown too accustomed to widespread acts of violence. We have come to expect inaction from our leaders in Washington. Now, as the students in Florida demand action, the steps taken by Congress in the coming months will determine whether we continue as we always have, with students for whom another school shooting is so unsurprising that it doesn’t merit a reaction. Or we change. We’ve been presented, it seems, with two options: militarization or regulation. For many students in this country, school is already an emotionally charged environment. Besides immense academic pressure, high-schoolers deal with bullying, cliques, and mental-health issues. Not only would increasing the presence of firearms further escalate social tensions for some students, but it would serve as a factor of alienation for others, eliminating the trust crucial to the classroom environment. In my experience, my teachers are already extremely conscientious of the power inherent in their position and expend a great amount of effort to cultivate trust. In turn, arming teachers would not only alienate many students; it would isolate teachers by forcing them into the position of an aggressor. While some may argue teachers would have a choice of whether or not they can carry a firearm, this would only create rifts between teachers—with some victimized for their refusal to “protect” students and others targeted for introducing weapons into the classroom. For me, school has always been a refuge. I cannot imagine that sanctity violated by the introduction of weapons. Every day, I walk into my favorite history class and discuss structures of governments all over the world, and my teacher implores us to think deeply and critically about society. Now I imagine walking into the same classroom, wondering if that will be the day my teacher has to pull the gun out of his desk drawer, whether I am actually safe there, whether a loud bang in the room across the hall was just a chair falling. This could be the world of future high-school students: paranoia. While I would like to see the elimination of guns altogether, I view protective legislation—such as universal background checks, raising the age to legally purchase a gun to 21, and banning assault rifles—as a positive step toward an ultimate goal: eliminating guns as a symbol of the freedom that the United States stands for. If the conservative right legitimately stands for civil liberties, then I applaud them—that’s what I want, too. But to me, freedom is not based on the right to own firearms. What about the parts of our society that prevent people from exercising their freedom fully? There are so many inequities in the United States that desperately need our attention, which if we helped alleviate would lead to the freedom that conservatives rally for. To them, I say, abandon your battle for guns and address something, anything else: our country’s crumbling infrastructure, for example, which in some cases means some cities don’t have clean tap water. I consider not having clean water a lack of freedom. High-schoolers get it: The gun debate is a farce to maintain money in politics and paranoia among the masses. Meanwhile, guns are fetishized in the media and have come to symbolize power and status. These all have worked together to get us where we are today, with many dead children as a result. They are also so deeply embedded in our society, and supported by powerful people, that it seems virtually impossible to change our country’s priorities. But that still doesn’t take away the fact that I want everyone in this country to have clean water, access to health care, and a place to live that is clean and safe and affordable. This is what most of the young people I know want and believe, too. The shooting at Marjory Stoneman Douglas High School revealed a deep, systematic failure, not a security failure. A grassroots movement among young people is rising up across the nation to treat the threat of gun violence as a public-health issue. My generation denounces the NRA’s monopoly over Washington and calls for the creation of just laws that provide a freer society through the elimination of deregulated weapons usage. In fact, the activism of the students in Florida moved the students of my school to rally in solidarity. It motivated thousands of other high-schoolers across the nation who also believe in these things to walk out of their classrooms in protest on March 14, and soon, on April 20. Although some may see the walkout simply as an opportunity to rebel, my classmates and I hold the power and the motivation to make lasting change in our gun laws. We will start a sea change, and we’re confident that future generations will carry it to completion. 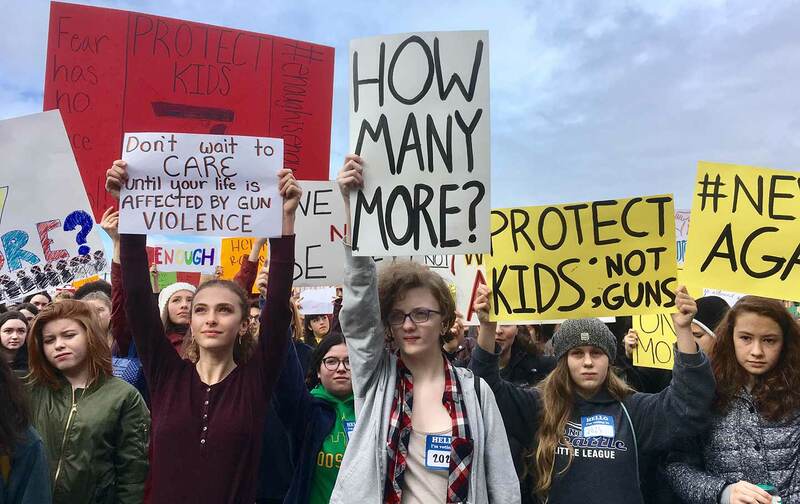 Now it is time for our politicians to decide: Will they prioritize the demands of the gun lobby, or those of the thousands of high-school students pleading for their lives?